Up until a few weeks ago, I could count on one hand — specifically one finger — the number of times I’d tried a homemade waffle. (Sad, right? And it was years ago too.) The hubs and I were at a beautiful little B&B in Kingston just after Valentine’s Day (because we were too cheap to pay the premium to go on the actual holiday) and the couple who owned it served my hubby fluffy waffles dusted with icing sugar in the charming breakfast room. I had poached eggs or something, as I’d never order something that decadent myself, but I do remember trying some, and of course it was frickin’ delicious. And the years (and years!) after that? Waffles just weren’t a part of our lives. (Nor were B&Bs.) Oh Eggo’s from time to time for the kids, but those really aren’t the same, are they? 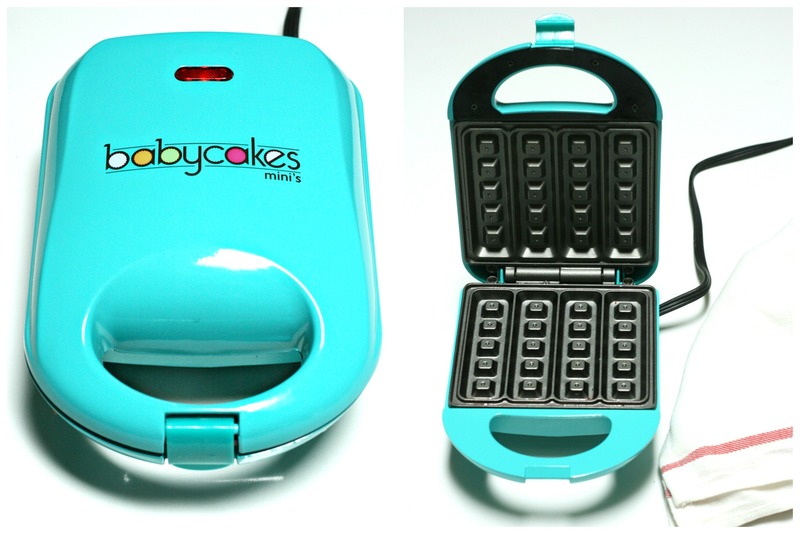 Then a few weeks ago I bought this babycakes mini’s waffle maker (Target! $20!). Changed. Our. Lives. Alright, so maybe I’m exaggerating just a bit, but it does do a damn good job. It heats up and cooks and minutes, it’s easy to use and it’s easy to clean. (The cleaning bit is key. You know if something’s a pain in the hoop to clean it’s just going to sit in the cupboard.) 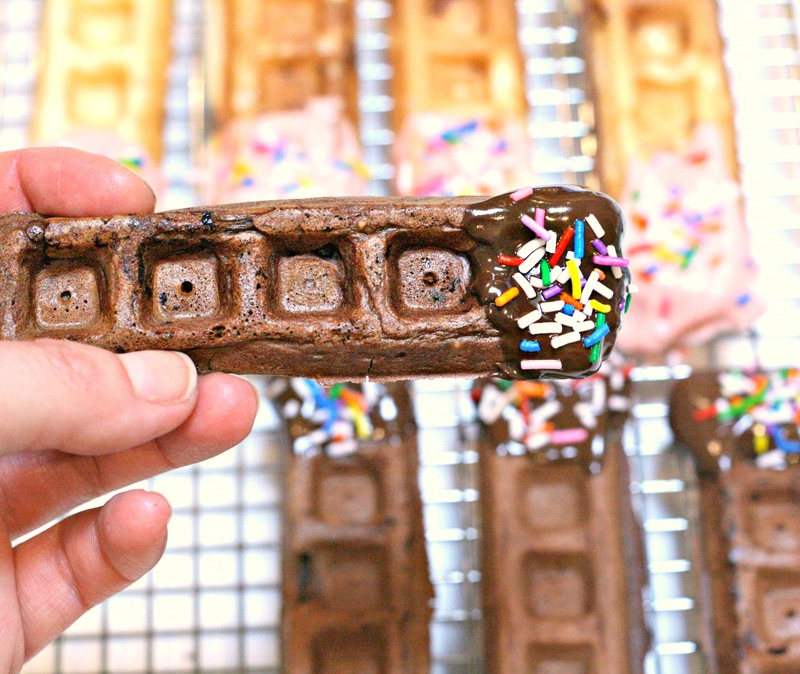 And it makes the cutest individual waffle sticks, which are ideal for little fingers. I’ve tried the basic waffle recipe that came with it, but I found the waffles a little tough and prefer my trusty one for pancakes, which I’ve included at the end of this post. 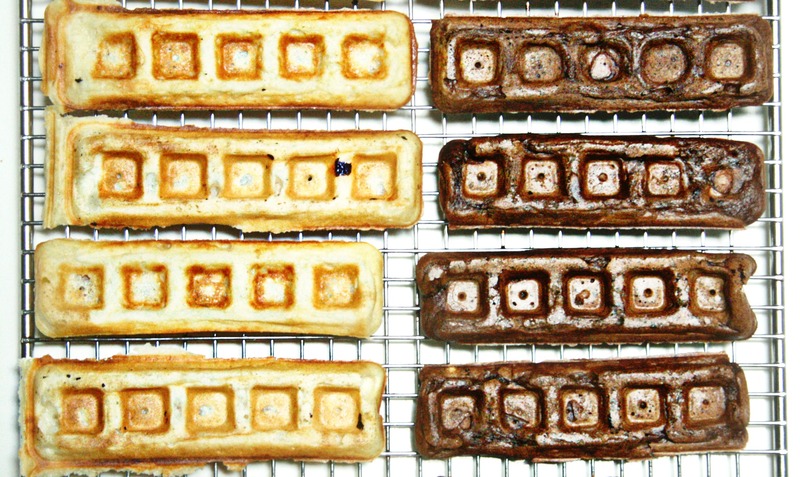 If you like a lighter waffle, you might like it too. You’ll want to cool them on a wire rack straight away so they stay all nice and crispy. You can also freeze them and reheat them in your toaster, stacking two in each slot. I went a little cray-cray and dipped them in chocolate and sprinkles, but they’d be just as tasty (okay, almost as tasty) with syrup. And you could easily skip the sugar and make your own savoury creations — say, herb, garlic and cheese — and serve them with a creamy dip. Wouldn’t those be great for a party? Zillions of possibilities! One thing’s for sure: they’ll be gone in seconds! Oh! 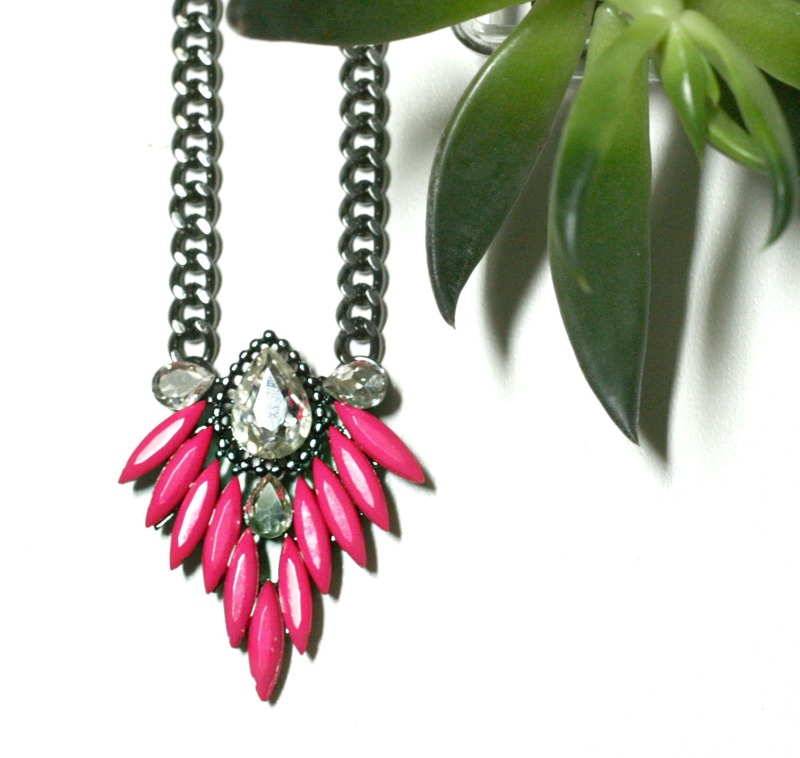 A little note about the accessories giveaway: now the Cara necklace is included too! If you haven’t entered, just hop on over here. The contest closes this Sunday, August 3 at midnight EST. You must leave a comment on the contest post in order to be eligible. Whisk dry ingredients. 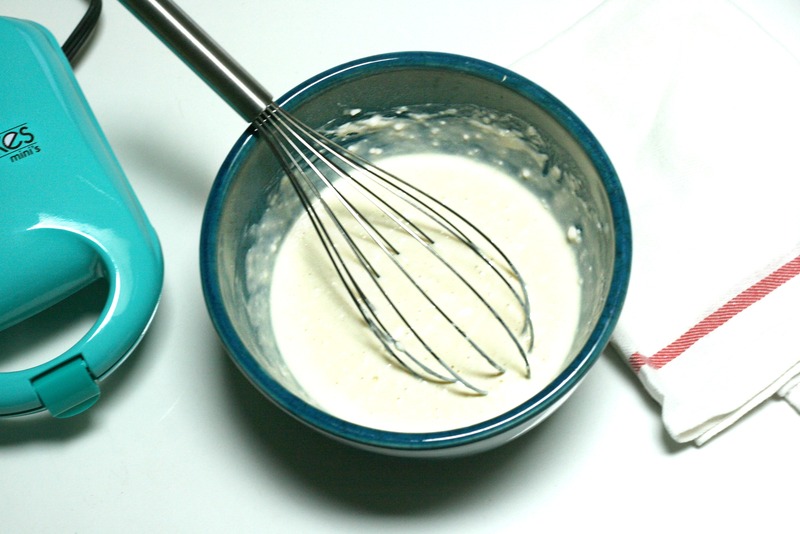 Add wet ingredients to dry and whisk again until combined. Careful not to overmix; batter should still be a little lumpy. 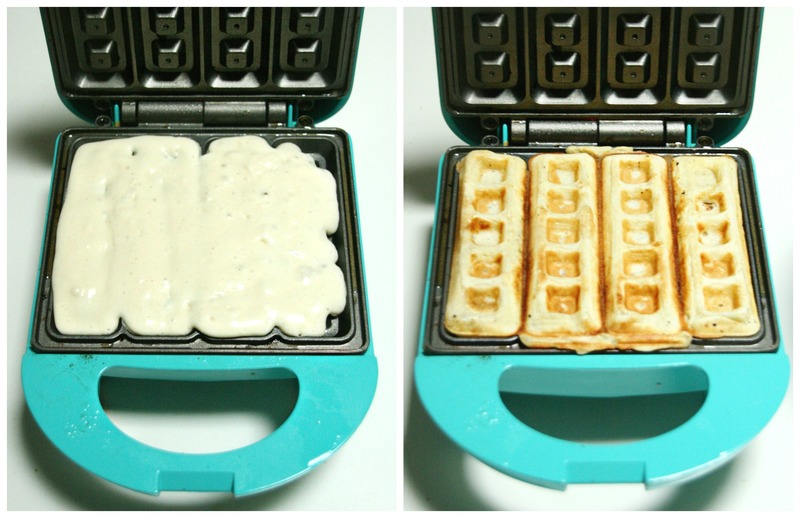 Cook per your waffle maker’s instructions. Those would be great for anytime you want something sweet and you are really wanting breakfast stuff. Every Sunday morning, my DH cooks us pancakes. It’s the one meal that I don’t have to cook. I hope he doesn’t see your post and buy me one of these cool gadgets 😉 Love that they’re finger foods. GASP! I love these!!!!! Such a fun idea! Thanks so much, Christina! Everything you make looks to.die.for! Looks delicious! I’m team waffle all the way. Here in Czech Rep, they sell waffle ON a stick at the farmer’s market… looks somewhat like a waffle popsicle. My family likes blueberry pancakes with whipped cream on top and maple syrup. I have a waffle make and should try the chocolate version for myself. Looks so yum! Thanks Helene! Your pancakes sound heavenly! Julie you have out done yourself again. When you did the preview I was sitting here wondering how you managed to get these little sticks to look so perfect, Target has everything. I am going to give your recipe a try “en mass” and freeze up a bunch for my teething baby and quick breakfasts for the two older ones. Oh Aneta, you’re SO kind! Let me know how they work out!